A while ago I did some posts which had the colour blue as theme (see here, here and here). If you want to have blue in your interior but don’t know how to combine it with other colours, perhaps today’s post can give you some inspiration. 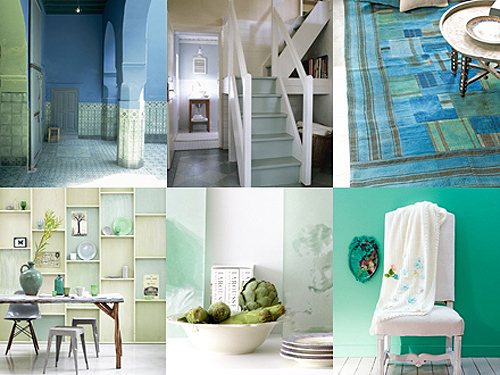 The image above, from the website Kleurinspiratie, shows that various shades of blue and green look great together. The paint colours above are from Flexa but you can get similar colours from other brands as well. 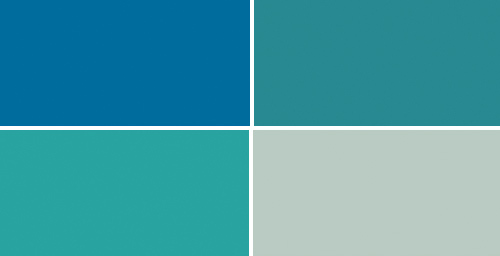 Colour names: Blauwst (top left), Azuurst (top right), Salon (below left), Zee (below right). One of my favourite combinations – so fresh. These colors are delicious! I do love my blues and greens. They’re so soothing…and somehow, in the dining room, they make me just want a big meal of delicious fruit — I think they’re the perfect background for such a meal. Definitely a favorite combination of mine! Such pretty pictures, and a neat website too!